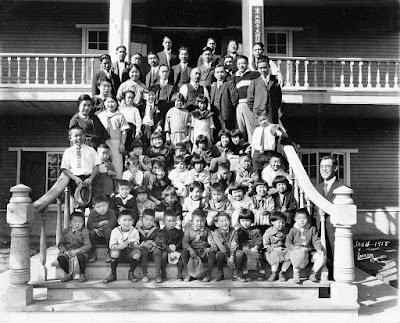 Here is a great photo of over sixty persons, mainly young children and about twenty teens and adults, posed on the wide and tall stairs at the Higashi Honganji Buddhist Temple in Boyle Heights. Taken on 4 January 1925, the image is almost certainly for education classes for Japanese children, although there are no inscriptions or markings on the photo to identify the occasion or the subjects. As usual with large group photos, especially of kids, you see a wide variety of expressions from those with serious faces to others with wide smiles, some looking a little puzzled and other distracted or with eyes closed. 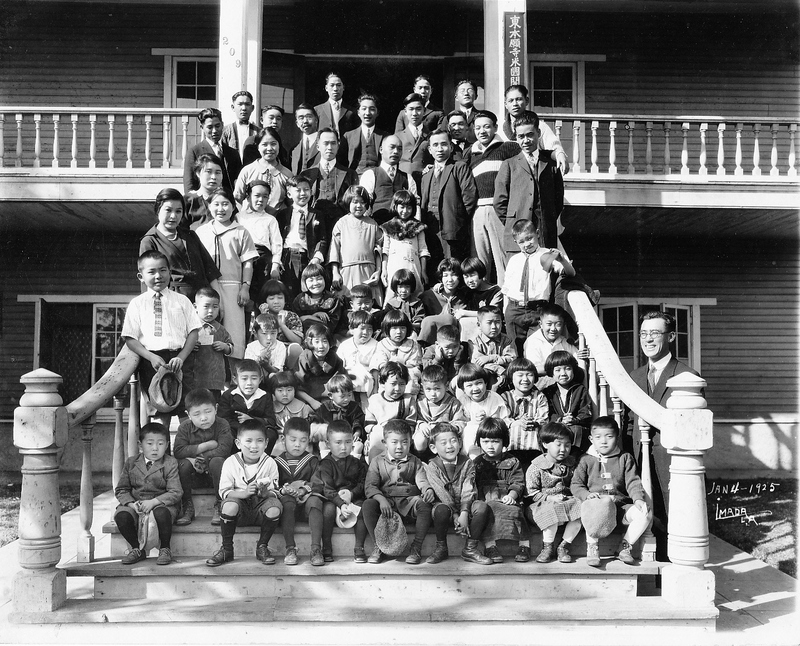 Taken on Sunday, 4 January 1925 by photographer Sadaichi Imada, this image of some sixty persons, mostly young children, is apparently of a youth education class at the Higashi Honganji Buddhist Temple at 209 S. Savannah Street, Boyle Heights. Courtesy of the Workman and Temple Family Homestead Museum, City of Industry, California. Note the two girls in the fourth row at the right with their arms around each other and the little guy fourth from right in the front row with a broad smile and hands clasped in front of him. With all of the men in suits or at least some combination of formal dress, there is, at the top right, a fashionable young man with a striped sweater and his arms around a couple of friends. Presumably the man with a bright smile standing behind the stair rail at the bottom right was a figure of authority at the temple. The photographer was Sadaichi Imada (1885-1952), who had a studio at 239 1/2 East 1st Street in the Little Tokyo neighborhood of downtown Los Angeles. A native of Hiroshima, Japan, Imada emigrated to the United States in 1902. It appears he began work as a photographer early on as he was listed with this occupation when he registered for the draft during the First World War. Imada and his family lived at his studio in the 1910s and then later lived near what is now Koreatown, west of downtown Los Angeles. During internment in World War II, Imada was sent to the Pima camp in Arizona and records in 1942 showed him to be a "retail manager" as his primary line of work and as a photographer for his secondary employment. He lived for several years after the war ended and his confinement in the concentration camp was over and he died in Los Angeles in 1952 at age 67. For more on the temple, click here for a 2012 post on this blog. If anyone out there knows what the occasion was for the photo or knows of any of the persons shown, leave a comment! Contributed by Paul R. Spitzzeri, Assistant Director, Workman and Temple Family Homestead Museum and Boyle Heights Historical Society Advisory Board member. Wow, thank you for sharing! Sounds like you have done some research... I am in Missouri and recently came across a couple of images marked "Imada Studios" Los Angeles. The imagery is of a Japanese family... I love history so the photograph got my attention. Mr. Imada was a great photographer, love your image of school children! Hello Anonymous, you might want to contact the Japanese American National Museum here in Los Angeles about your photos. www.janm.org. Hello Marchelo, thanks for visiting the site and for your comment. Hope you drop by to check out what we have on a regular basis. I'm a 48 yr old woman from Boyle Heights. I can't remember what buitiful building was their before being torn down where Food 4 Less now stands. But the beautiful bell still sits there in remembrance of a wonder structure that should have been renovated not removed. I remember my mother taking for walks and waving at people in the window and they would wave back. Anyine know what that building was? It was a bell the sat at the top of an elderly home called "Casa De Las Hermanitas" Many nuns were the caretakers , some were also nurses who looked after the elderly folk.